Why is nivolumab (Opdivo) potentially an important new option for people with metastatic melanoma? 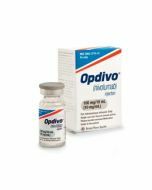 Nivolumab (Opdivo) is a prescription medicine that has been approved by the European Medicines Agency for the European Union for use in treating metastatic melanoma, and has been approved for other cancers too. For melanoma it is prescribed for patients who have advanced cases of melanoma that cannot be treated with surgery. This medication has also been approved by the U.S. Food and Drug Administration for the United States. How effective is nivolumab (Opdivo)? The risk of death was reduced by almost 60% compared with the chemotherapy treatment. The progression-free survival (which is the time that patients live without their disease getting worse) was twice as long with nivolumab compared to the immunotherapy used in the second study. In the study where nivolumab was tested alone, one in four patients saw their tumors shrink, while some patients' tumors disappeared entirely. Nivolumab (Opdivo) works by improving the immune system's ability to recognize and fight cancer. Your immune system is responsible for dealing with unhealthy cells or other invaders that pose a threat to your health. This medication targets your immune system's T-cells specifically and may improve their effectiveness as they attempt to identify and destroy your cancer cells. If you are interested in nivolumab (Opdivo), you can gain more information and insight by hearing what patients' say about this medication on the Melanoma Research Foundation’s website. You can also see how other patients have reviewed the medicine on Patients Like Me - which currently shows that 31 people have submitted feedback. When is nivolumab (Opdivo) prescribed? Your doctor may prescribe nivolumab (Opdivo) if you are over the age of 18 and you have melanoma that cannot be removed with surgery and/or has spread to other parts of your body. This medication is prescribed to both BRAF positive and BRAF negative patients with advanced melanoma. BRAF is a gene involved in the formation of proteins that transmit chemical signals within cells. The BRAF gene belongs to a class of genes known as oncogenes. When mutated they can cause normal cells to become cancerous. Doctors will test for the BRAF mutation and you will either be positive, displaying it, or not (negative). How is nivolumab (Opdivo) administered? Nivolumab (Opdivo) is typically administered as an infusion, which means it is injected directly into your vein. Your treating doctor will tell you how often you will need to receive infusions. What are the side effects or adverse reactions to nivolumab (Opdivo)? Some patients may experience side effects while taking nivolumab (Opdivo). Some of the most common side effects of this medication include gastrointestinal issues, fatigue, shortness of breath, weakness, pain in muscles, cough, itchy skin, fever, rash, decreased appetite, headache, and upper respiratory tract infections. If these side effects are severe, the dosage may be altered or the medication may be discontinued. Opdivo (nivolumab) is approved and available in a number of countries. If this medicine is not available in your country, we may be able to help. Please contact TheSocialMedwork for further information. Please note, patients purchasing a medicine through TheSocialMedwork always need a prescription from their treating doctor. Phillip is a licensed physician in the USA who also holds a PhD in Microbiology and Immunology.